The DishFish Scrubber is the ultimate dish-cleaning tool because it gives you a new kind of cleaning power that makes dish-cleaning tasks easier and your cleaning more thorough. Its ergonomic shape and unique flexible, scratch-free PowerCells deliver superior cleaning. When you clean your dishes and sink with the DishFish, you know they're truly clean! The DishFish's fish shape allows it to dive deep into tight spaces. PowerCell Technology™ delivers unsurpassed cleaning performance while providing scratch-free results. 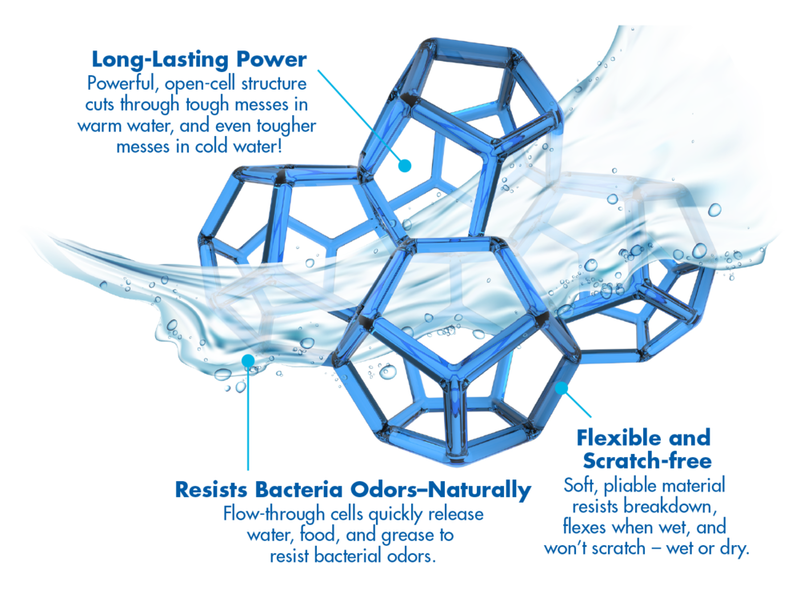 The PowerCells last long and resist bacteria odors, making it perfect for daily, kitchen cleaning tasks. Received my scrubber yesterday after seeing it on social media. I have been using the regular 3M ones like forever (who hasn’t) and when my dishfish came in I was pleasantly surprised. I like this a lot. No smell, not too thick or too thin, flexible, won’t scratch, fits great in my hand, cleans well, lasts longer. There’s one hole to clean silverware better. Not sure what the other hole is for? Maybe decoration?